At the 2014 FAST EXPO yesterday, and the Wearable Tech EXPO this week, developments in the space are proving to be nothing less than fast and furious. Developers from all over the fitness and sports wearable space are contributing to what is shaping up to be a very exciting week at the Jacob Javitz Center. I was fortunate enough to sit down with thought leader Christopher Cox and discuss the cutting edge developments pivothead is working on. pivothead wearable imaging launched in June 2012 with the world’s first 1080p recording eyewear, only a couple months after Google glass’ original announcement. Its next generation device, coming out later this year has a much different focus than glass. The primary difference is the lack of a heads up display (HUD). pivothead is focused on creating content through live interactivity and broadcasting as opposed to consuming content. The platform is called live.pivothead.com. Out of the box people will have their own live channel. Literally as simple as, connect to computer, create account, start streaming content to your own url. Not all content is meant for immediate viewing, sometimes this “lingering” content—15-30 second chunks of video that could be a fun experience the user wants to share—can be preconfigured for a video to be pushed somewhere, linked in real-time and stored on the cloud, viewable for some time after recording. This is possible because pivothead’s offering can record natively as the glasses push out a second stream for broadcast. The next generation glasses provide full picture functionality and focus on a really good camera experience. The team at pivothead decided they didn’t want to have Google glass functionality, but instead wanted to be about awesome content. The HUD fights for power, and takes away from the focus on imaging quality, broadcast capability and creating content—the lack of a HUD is a key differentiating factor for pivothead. 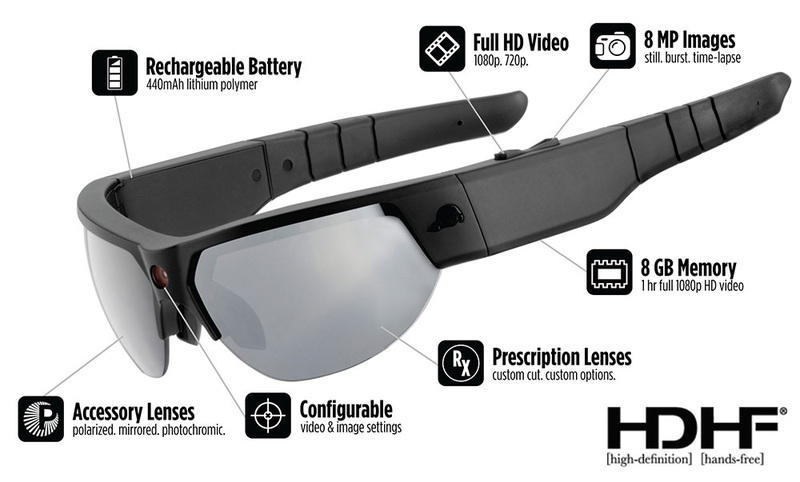 The glasses include the same chip set as the go-pro camera, which allow filming in 1080p as compared with glass that is shooting in 720p. AT a $299 price point, the glasses are quite reasonably priced, and with the addition of Smart Mods functionality is increased dramatically. For example, the “live mod” is purposed for broadcast and is paired with the “fuel mod”, designed for low battery use. The combination sells for $99, keeping the price point low and offering amazing functionality. The “Air mod” can run native apps, broadcast as well as provide bi directional communication. This offering targets the business world to foster collaboration and teamwork. People have the freedom of nearly 100 percent customization—set notifications, networking and content can be pushed to one centralized location. Cox proclaimed, “We believe the direction we are going is what is going to drive mainstream adoption...not putting a computer and monitor in someone’s eyesight.” Pivot Head sees this traditional experience as too self-centric, “we are about sharing, our glasses are about sharing what you’re seeing in real-time…out of the box…we don’t need an ecosystem with thousands of apps to make for a great user experience.” True point is to view media in a seamless manner, focus on best quality imaging and broadcast performance. Don’t miss out on the last two days of the Wearable Tech EXPO, running today and tomorrow at the Jacob Javitz Center. It is certainly a hot time in ‘city’ July 23 and 24, don’t get left in the cold.